Everyone wants longer, fuller, more luscious lashes, unless of course you are a 4 year old boy and you already have them – they always seem to have the longest lashes – how does that work? There are a few tricks that you can use to enhance your own lashes without going down the expensive lash extension route – which can often look quite tacky if the are not done correctly, or not maintained every 2 weeks. 1 – Always remember to remove your makeup before you go to bed, old mascara will dry into your lashes, causing them to break & fall out. 2 – Avoid over using waterproof mascara – use only for special occasions, again this can be drying – causing brittle lashes. 3 – Curl your lashes using a good eyelash curler – my fav is the curler by Shiseido – I haven’t found a better one in 12 years! Always curl before applying mascara! Curling after will cause lash breakage and makes your lashes clump together – not pretty! 4 – Use a mini lash curler on the edges if you have larger eyes so you catch all the lashes. 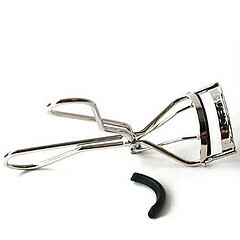 Option – If just looking at a lash curler freaks you out the try a heated comb instead. 5 – Prime your lashes! I love a lash primer – MAC do a great lash primer, as do Dior they will thicken, condition and helps curl your lashes that little bit more. 6 – Find your perfect mascara, My favourite at the moment is Dior Iconic over curl – which has a curve to the wand so it catches all the lashes in one swoop! Tip – always remove the excess mascara from the end of your wand before applying directly to your lashes. Concentrate at the base of your lash, using a zig-zag motion at the root and the stroke upwards and repeat. 7 – For the bottom lashes turn your wand vertically and run along the bottom lash line. 8 – If your mascara looks unintentionally clumpy then use a metal comb or lash brush and comb through and separate the lashes. Look down, gently and carefully use the comb to brush down through the back of your lashes. and if after all this you still don’t have the lashes you desire – fake it with a pair of false lashes!! Tags beauty shoot, best mascara, Dior, false lashes, lash primer, Lash republic, longer lashes, MAC Cosmetics, makeup advice, makeup artist sydney, makeup for makeup artists, sydney bridal makeup.